Keywords: Canal Boat Stoves Woodburning Wood Burning Multifuel Log Store Trolley Storage Wales British Made in Uk in Quality Efficient Efficiency Contemporary Modern Flue Chimney Stove Top Oven Small Cooking Backboiler Boiler Narrow Stoves. 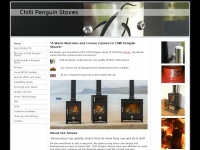 The websites creator or author is Chilli Penguin Stoves. Copyright Chilli Penguin Stoves 2019. All Rights Reserved is the owner of the copyright for this website. A profile of Chillipenguin.co.uk was found on the social network Facebook. On this web server 10 other websites are hosted. The language of those websites is mostly english. A Nginx server hosts the websites of Chillipenguin.co.uk. The website uses the shop software system WooCommerce The website uses the latest markup standard HTML 5. The website does not specify details about the inclusion of its content in search engines. For this reason the content will be included by search engines.